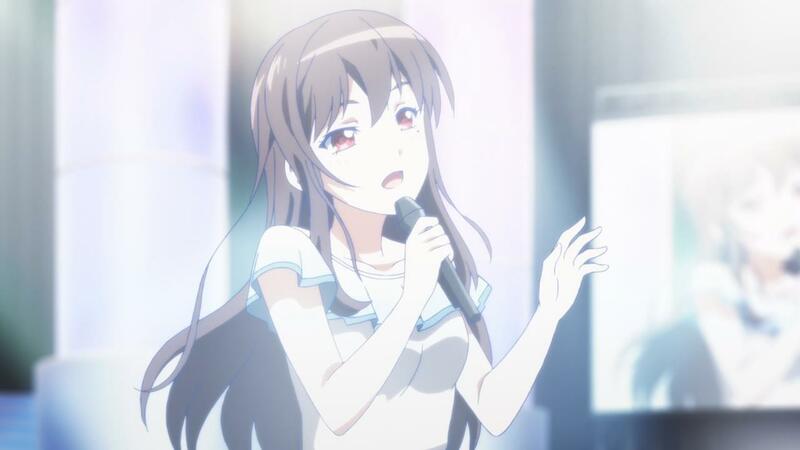 So wait… There was a friggin sequel to Suzuka coming out this season and I didn’t even know about it? Man, 2017 is already taking off, and its only the beginning of its first season. I suppose that’s what you get for kind of taking a season off and then trying to play catch up before everything starts airing. I never did get my Winter 2016 preview up, but man is this season full of stuff that I’m excited for. A sequel to Suzuka? Well that makes for a rather pleasant surprise, if only because I just wasn’t expecting it. Now… Having said that, even though I’m pretty excited to get more from the creator of Suzuka, I will say I wasn’t entirely blown away by the double episode opener for this series. 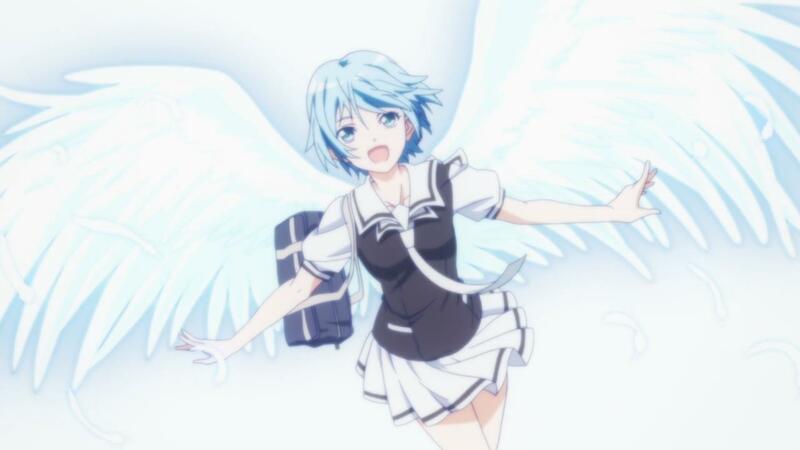 There was an overwhelming sense of something really missing in Fuuka, that just really set it apart from Suzuka. To those who are unaware (and really, most of you would be), Suzuka, the prequel 26 episode series and its original manga, is one of my favorite romance drama stories from the good old days of when I was a teenager. Suzuka came out 12 or so years ago, which My god, does that make me horribly old (which is a topic for another time and place, maybe with a therapist?). Where was I? Oh yeah, Suzuka happened more than a decade ago, and since then we’ve had a few other works from mangaka Koji Seto, most notably “Kimi no Iruch machi”. 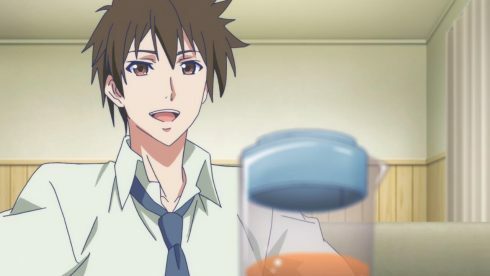 While I won’t go into how terribly botched that particular anime adaptation was, I will point to the scathing review I wrote for it, when the series finished airing in 2013. Yes, I recognize that Kimi no Iru Machi isn’t all that important to this series, but it isn’t entirely unrelated either (Both series and Suzuka are set in the same universe after all). 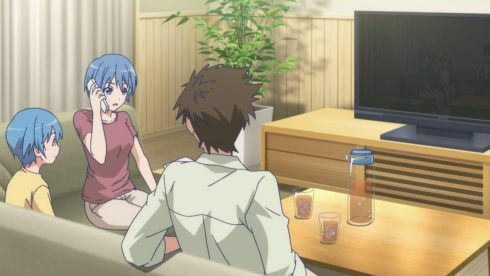 What is important, and why I bring Kimi no Iru Machi up, is because there’s a very clear indication of some of that series’ dire problems cropping up here. I’ll elaborate in a second, but before that, its worth noting that the Kimi no Iru Machi manga, which finished about a year after its anime adaptation, didn’t come together all that great in the end. The story lost focus after it put some of its characters through the ringer, and unlike Suzuka, just kind of fizzled out. 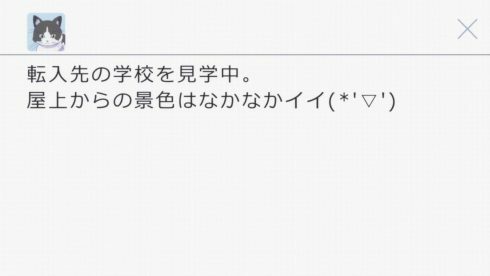 The manga and the story really felt like they ended because Seto-sensei just ran out of stuff to really use, and less so because there was an actual end game for that story in sight. 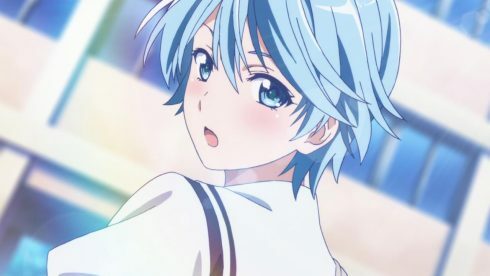 Fuuka, however, unlike Suzuka, is really turning out to have some of the story focus and smart setup that made Suzuka such a memorable series all those years ago. 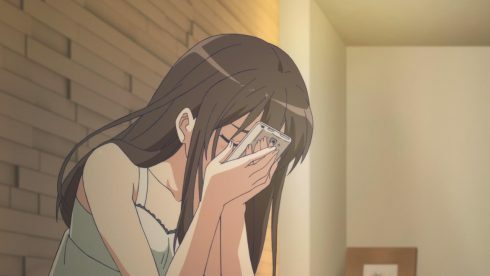 Suzuka was at times painful, and really gut wrenching, with unrequited love, lots of mistakes from all the main characters, but it eventually ended on a pretty strong note (in both anime and manga form). Fuuka seems to share that same DNA, for good or for ill.
See Suzuka, back when I was a teenager, was a pretty interesting story to see. Back then tropes like Tsundere, bossy girl characters, love triangles and high school romance itself, hadn’t worn out its welcome nor was the idea of a guy relentlessly chasing a girl considered bad. It was a different time, when the idea of the guy chasing after the girl was considered good romance, and not just well.. creepy and annoying. 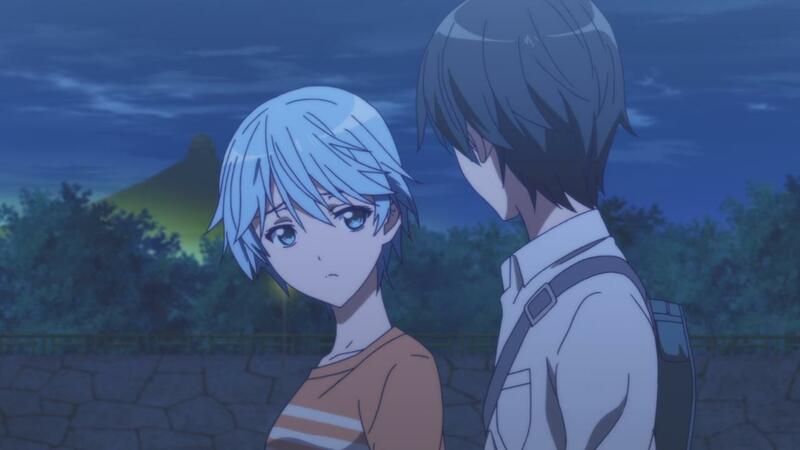 And the fact of the matter is, Fuuka feels too much like its prequel series than it probably should even if it doesn’t seem to have that “person chasing uninterested person” angle in it. There’s a sense of immaturity and almost young adult novel-ish like tone to the whole romance, and it doesn’t feel nuanced but rather soap opera-ey instead. 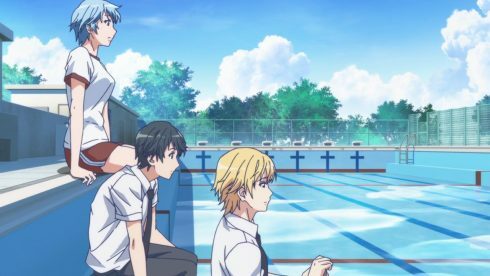 Its not terrible per say, but after some truly remarkable and ground breaking romance series in the past few years, Fuuka just feels awkward and out of place, and I’m sure it’ll offend a lot of the contemporary romance anime audience of today. 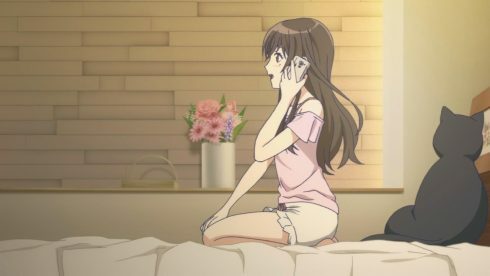 Awkward really is a great way to describe this series, but it thankfully has some charm to go along with it’s less finer aspects. 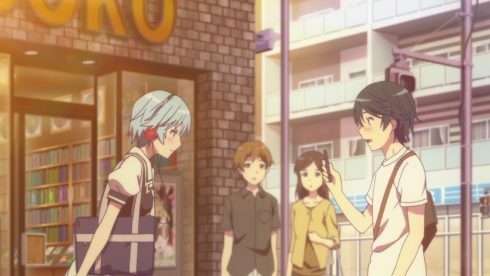 There’s a real sense of boyish immaturity to the writing, story and dialogue to Fuuka but it does feel a little endearing, in a childish sort of way. Plus, its quite clear from the opening two episodes that Fuuka is going to be a painful love triangle. 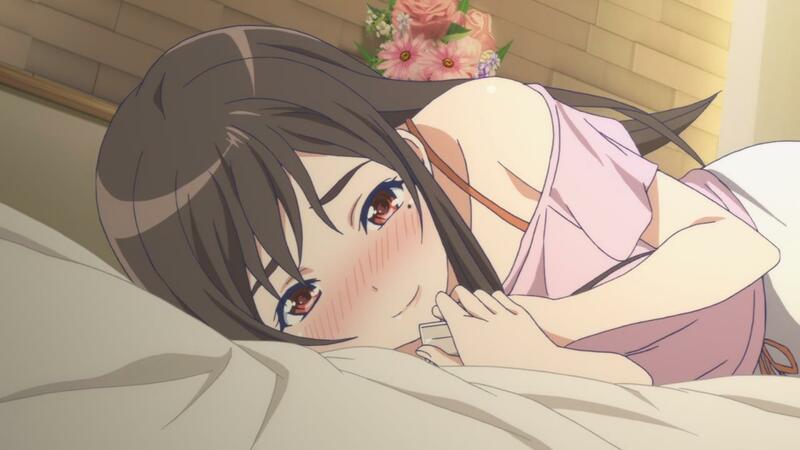 I haven’t seen a good love triangle anime in a while, the last notable one being White Album 2 which came out in 2013. And White Album 2 is an interesting mention, because there are quite a few similarities between that series and this one. 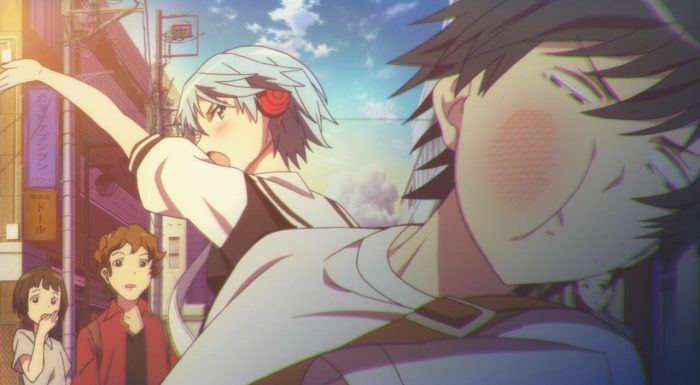 But anyway, as is the case with love triangle stories, there are three main characters, two girls and one guy, and it does look like we’ll be seeing all three of them have to deal with the rather unpleasant situation that they’ll find themselves in. 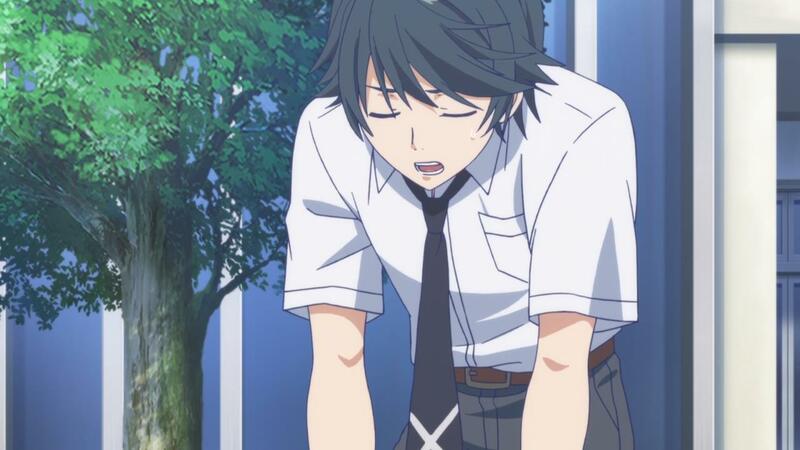 And the awkwardness that I mentioned before is really present in all three main characters of this show. 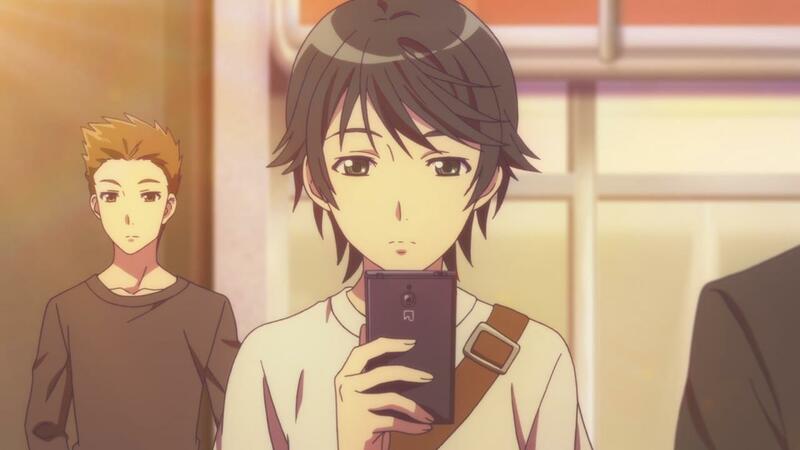 Yuu (the main male lead), is a really interesting main character, because he’s based on what you’d call a stereotypical teenager of the digital age, from the preservative of a much older generation. “Kids these days are always on their phones, on the twitters, tweeting up the things!” is the phrase that came to my mind as the first episode introduced us to Yuu. 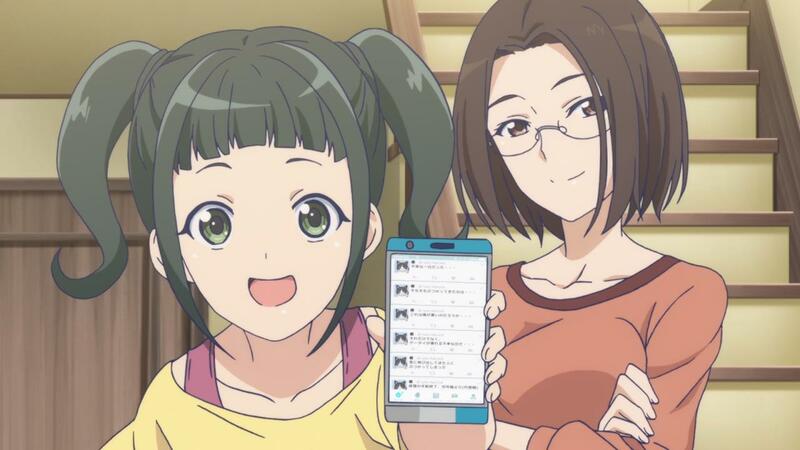 Yuu’s a sort odd guy that’s addicted to his cellphone, and who likes to tweet about everything he does. He’s, awkward, anti-social and someone who’s supposed to be bad with people. You know, the kind of guy that is more or less comfortable with his digital social media space instead of “the real world”. Or rather, that’s what the show wants you to think as he’s introduced. It turns out that Yuu is a lot more average and normal than you’d think, and a lot more like a typical awkward teenager that’s just trying to figure out his place in life and society. Yuu’s introduction from episode 1, to his somewhat more grounded take in episode 2, feels like Seto-sensei kind of fumbling and saving himself at the very last moment. 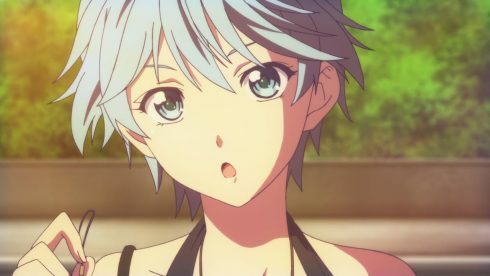 Fuuka (one of the female leads) on the other hand, i.e the character whose name is featured in the title, is a more typical female lead for these kinds of stories. She’s brash, bubbly, and is just reckless and in a rush to get places. She’s friendly but she’ll also jump to conclusions rather quickly. 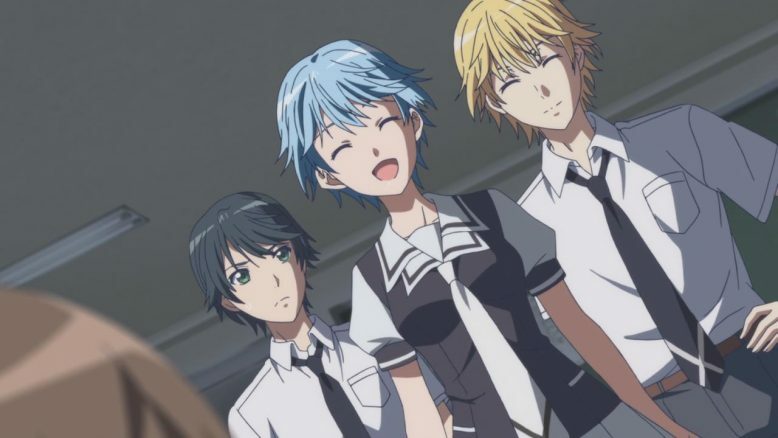 Oh and the show lets it be known that Fuuka is actually the daughter of Yamato and Suzuka (The two main characters from the prequel story titled Suzuka). 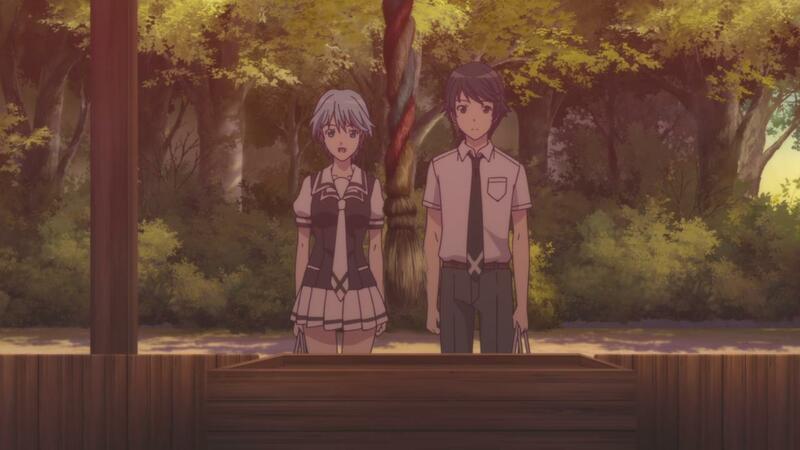 That’s a pretty big tie-in, and it kind of gives Fuuka a really interesting “color” to her character. And let me tell you, Fuuka’s character, is a bit of a mess to start off. I just couldn’t reconcile how Fuuka was both the angry “Ewww Pervert!” female stereotype, and also the tomboyish, excited and overly cheerful likeable girl. Turns out, what Seto-sensei tried to do here, is combine Suzuka and Yamato’s characteristics from his first story. 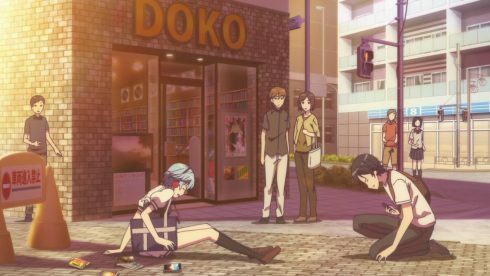 When you look at it that way, Fuuka’s weird contradictory existence ends up making some semblance of sense. 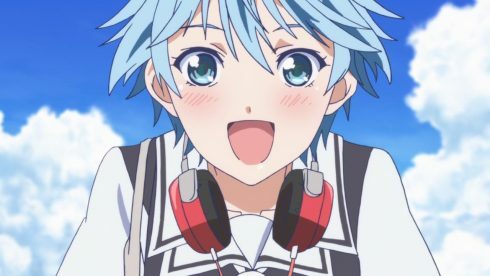 Its still jarring and weird to see how Fuuka basically oscillates between Tsundere and flat out likable cheery girl, but that’s because her genetic makeup both writing wise and DNA wise, is based on the mixing of two polar opposite people. And I admire the attempt, to create a character like that, even if Seto-sensei and the anime itself doesn’t quite nail the execution. 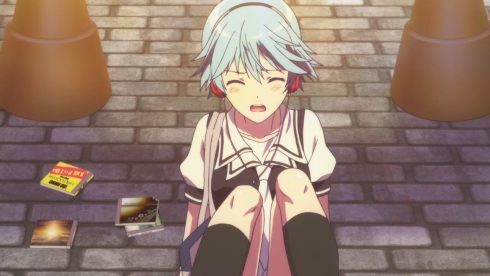 Fuuka is very much like Yuu, she’s a character that feels kind of rough around the edges, but you can see the creator behind both of them, really trying. Which, I think, was enough to keep me interested and involved in this story. I’m enough of a fan of Suzuka, that I can’t help but watch this series out of sheer appreciation for the original story and the hope that this may end up being just as good. 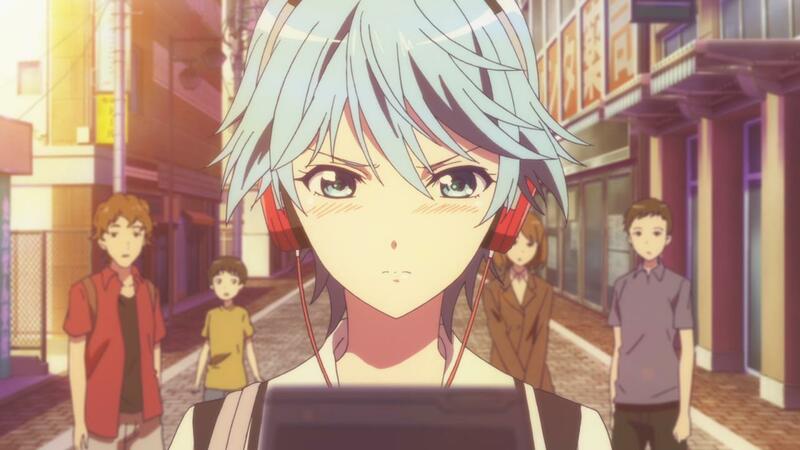 I mean, Fuuka isn’t horrible (as a show and a character). There’s some spades of brilliance in there too. I like how Fuuka is a character that’s trying to find her passion in life, something that I think many people and teenagers struggle with in high school. 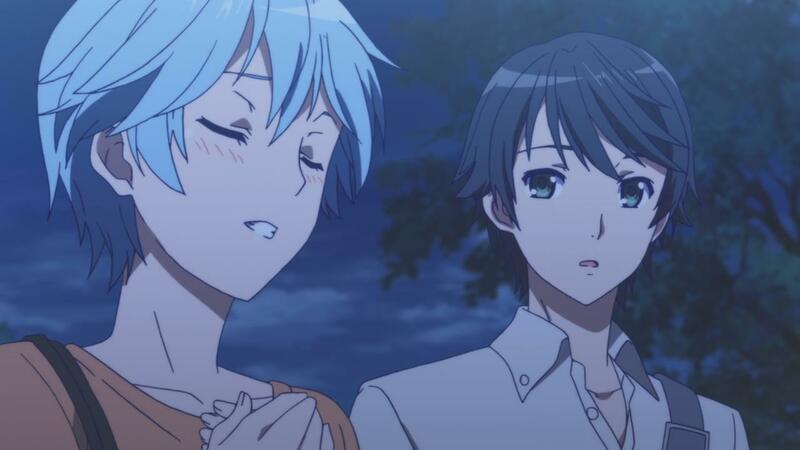 I like how the romance that’s building between her and Yuu isn’t necessarily the only thing that Fuuka has, but rather one major aspect of the story. Speaking of aspects, I suppose its worth talking about Koyuki as well. 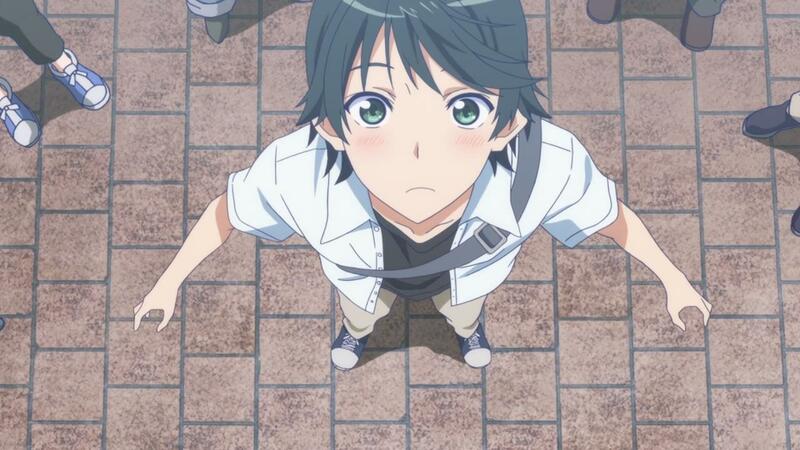 She’s the “onsananjimi” (childhood friend) character, and seems to be pretty heavily in love with Yuu. She’s a popular singer at the the time the series opens, and seems to have based both her songs and her career on her love for Yuu. 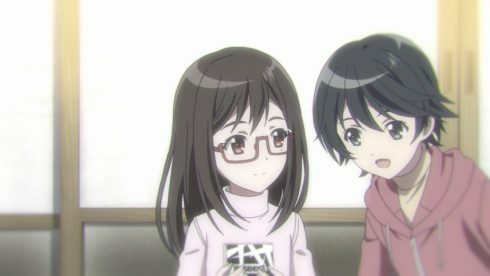 Koyuki is awkward as well, if only because you can see how fantastical and twisted of a perspective she has with regards to Yuu and love in general. Her emotional reliance on gratification from the guy she likes, but barely even knows, is very unhealthy, and is pointing towards something that’s really going to blow up in her face. Fuuka and Yuu seem to be developing quite the bond, while Koyuki seems to be hoping for something much more from Yuu on the side. Couple that with the mere fact that a popular high schooler musician is into a rather unremarkable childhood friend, and the whole story starts to buckle a little under its enormous asks for suspension of disbelief. I’m excited for this Love Triangle. 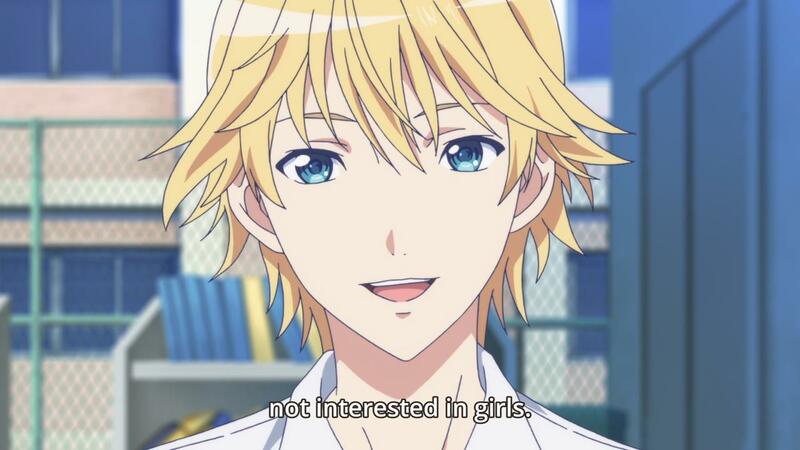 Right Yuu-kun? Its clear and evident that we’re going to see something like what we saw in Suzuka, where the three title characters are going to be stuck in an unpleasant love triangle. Which, If I’m being honest about, I’m kinda interested in I guess, I’m not entirely sure why this story is actually being told, and can only guess at this early stage. Is this Seto-sensei’s round robin? One more pass at the topic that he nailed quite well? Or does he plan on doing something different later on? I mean, the setting here is pretty different from his earlier works. 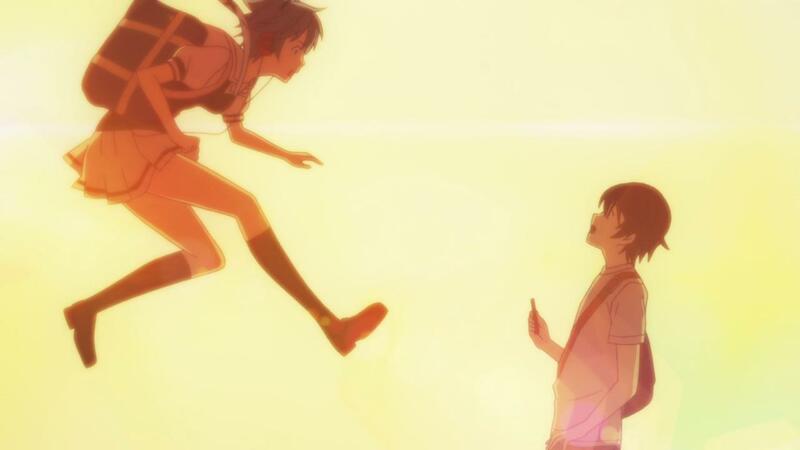 Suzuka was a sports romance series, while Kimi no Iru Machi was just straight drama. 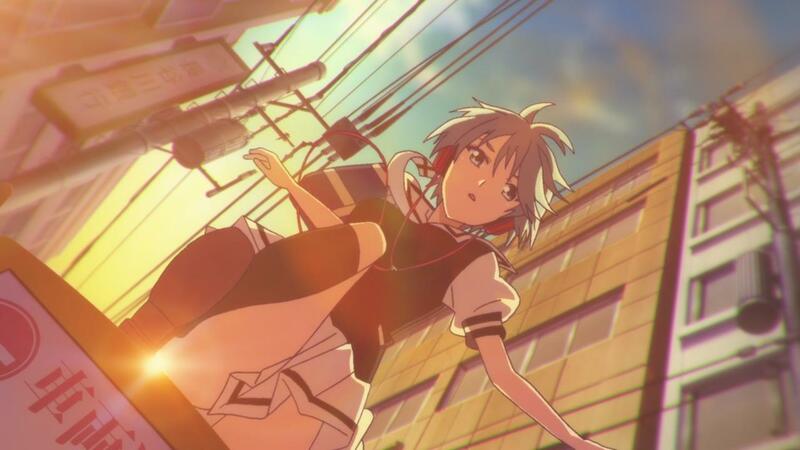 Fuuka seems to be set in the whole music realm. By the end of the second episode we have Fuuka forming a K-On club (Light Music Club) with both Yuu and her friend Makoto. 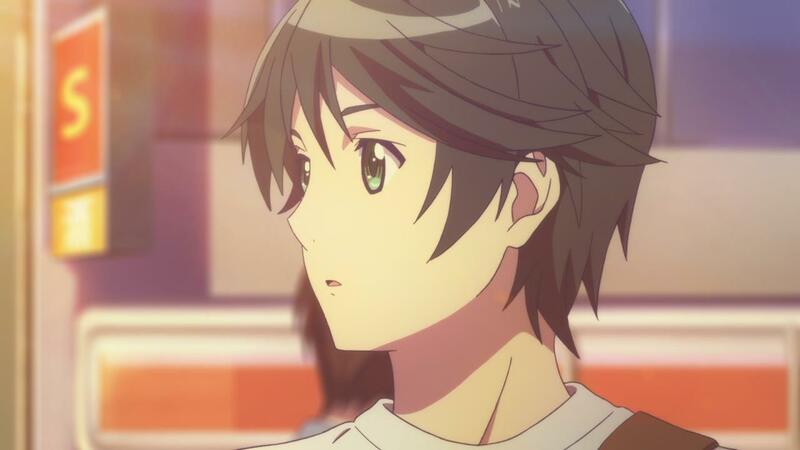 Makoto… Yeah…. 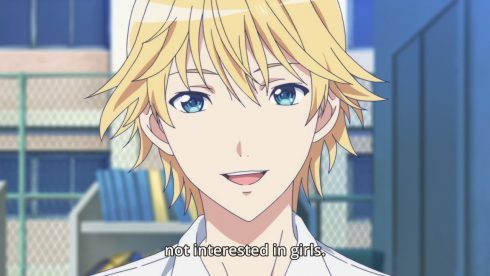 We’ll talk about Makoto some other day, but lets just say the guys loves spouting cheesy as heck lines and Mr.Fancy pants isn’t, in his own words: “interested in girls”. Which brings me to why I’m sort of worried about Fuuka as a series. 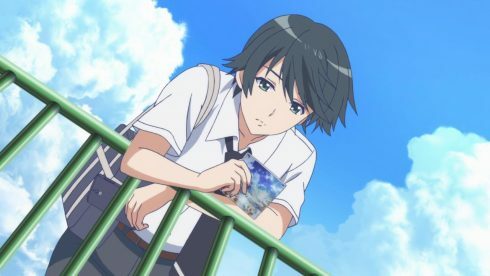 I mentioned Kimi no Iru machi, and even though this adaptation is being done by a completely different studio, I can see some alarming similarities. 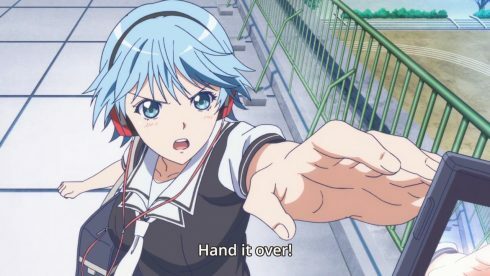 For one, Fuuka, from its first two episodes, feels like its rushing through stuff already. 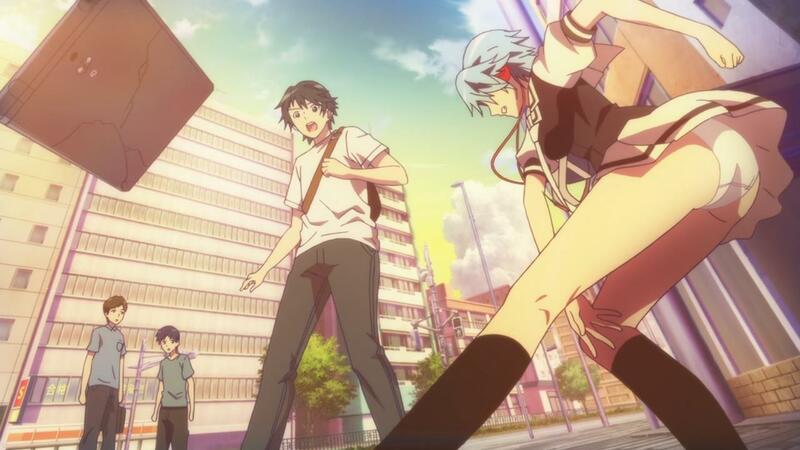 Fuuka is only 12 episodes, which again, seems to be the cause for that brisk pacing. Its not too damaging yet, and it at least doesn’t feel like we’ve skipped over anything too important, but I haven’t read the manga, so I have no idea. I do know some scenes just don’t flow as well together, and the transitions between them feel rather rushed and abrupt. Pacing aside, the other thing, that really worries me, is how the voice acting and animation feel rather off and cheap at times. Fuuka is the first time I’ve actually noticed that the lip syncing for an anime character was actually pretty off. 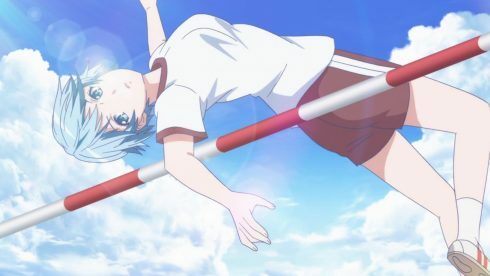 There isn’t a lot lip movement in anime anyway, and the fact that it feels off is something so rare, that it just stands out. I’m also not digging Fuuka’s voice actress Lynn, who seems to perform her lines a bit too quickly for comfort. 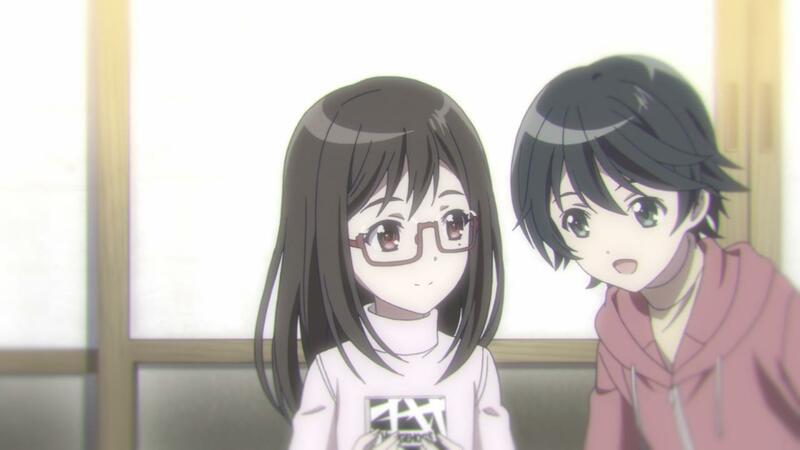 Its faint, but its noticeable, and the very fact that dialogue and voice acting are noticeably weird, is something I just haven’t seen from many anime series, Kimi No Iru Machi being one of the few exceptions in a very large swath of titles in the entire medium. So where does all of that leave us? Well, I won’t call Fuuka some amazingly awesome series that you have to watch. It feels a bit immature and rough around the edges, and I feel like most people today may even find it offensive. I am not hating it, and am intrigued, but who knows how much of that has to do with this show’s ties to Suzuka. Still, like I said earlier, its not entirely bad, and I’m intrigued enough to cover and go through and write this long of a post on it, so I’ll stick with it. 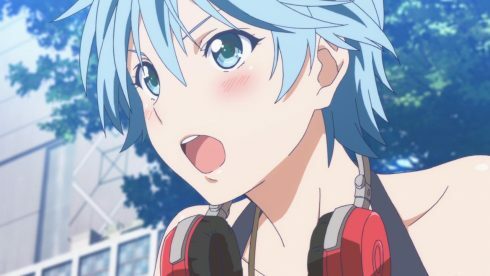 I’m curious to also see just how much of the “feels” Fuuka (the show) is going to extract from me and if it can, that will be pretty nice. 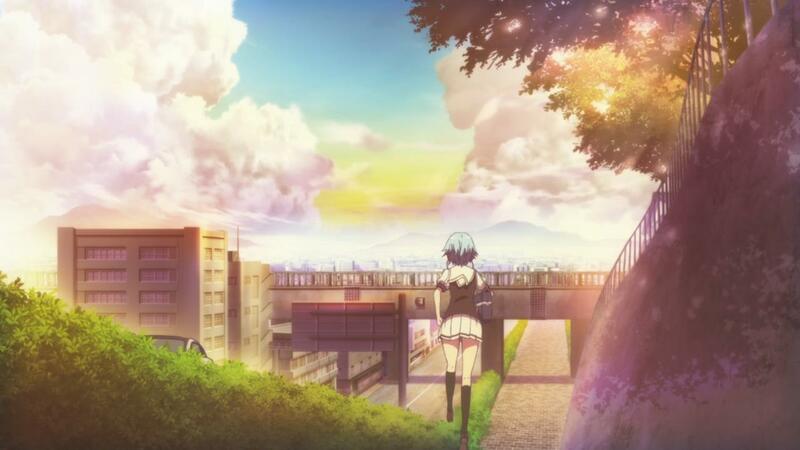 Only time will tell if Fuuka as a story and as an anime series, will be able to live up to the title that it is a sequel to. I suppose we’ll find out together. I’ll be blogging this series, and since its only one cour, I think it will be an interesting thing to go through and evaluate. I’m not expecting to be blown away here, but there has been a noticeable lack of stories like this, and I do remember Suzuka quite fondly. Here’s hoping this show keeps me and whomever is reading this, interested, and doesn’t turn out to be a disappointment that I have to trash every week. Something tells me that Fuuka is going to surprise, and for now, that gut feeling is what’s keeping me invested.